How to make a delicious Okonomiyaki! Okonomiyaki is the famous "Osaka soul food". Sometimes it is referred as "Japanese pizza" perhaps because it has a same kind of dough. It really seems to be popular in Osaka-area. Okonomiyaki is a great Japanese food, often found in Japanese izakaya. The dough is made from flour, water, eggs, and cabbage. Sometimes mushrooms, onions, meat, seafood or chicken is added. There really can be almost anything. 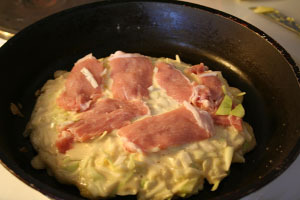 Katsuobushi (shaved benito) or aonori seaweed and Japanese mayonnaise and okonomiyaki sauce is then added on top of the fried- pancake looking okonomiyaki. Especially, okonomiyaki tastes good with Japanese beer such as Asahi or Kirin. Fry the dough like a pancake in a small frying pan. Gas stove is best. Turn it over. This takes some practise, so don't get discouraged in the first time. When fried well, so that the okonomiyaki remains in it's solid form, serve with katsuobushi, aonori, mayonnaise and okonomiyaki sauce. The okonomiyaki must be hot so that the katsuobushi flutters when the warm hair (and scent!) rises from it.